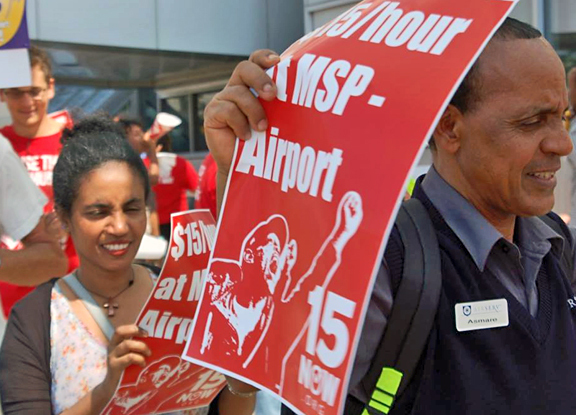 Backed by supporters from the community, airport workers kept up their public campaign for $15 per hour and a union, rallying Saturday at Minneapolis-St. Paul International Airport. MSP workers’ organizing efforts, supported by Local 26 of the Service Employees International Union and 15 Now Minnesota, already have led to victories. Earlier this year the Metropolitan Airports Commission (MAC) responded to workers by passing a paid sick policy and raising the airport’s minimum wage to $1 above the state’s. But workers like Ali said they remain committed to ending poverty wages and improving working conditions at MSP to ensure a safe, secure and stable airport for both passengers and workers. Hundreds of workers and community supporters who share Ali’s concerns signed a petition presented to MAC Commissioner Erica Prosser during the rally Saturday. Prosser pledged to make sure they were delivered to the MAC chair.